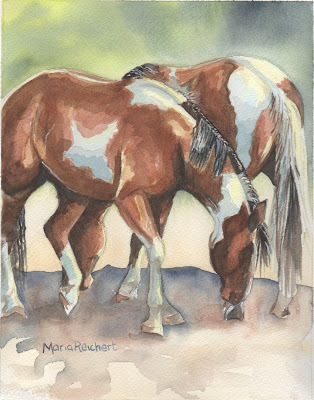 Here is the finished painting of the two paint horses. I tried to model the shape of the horses a little more, and defined the legs with the background dirt. I enjoyed this painting a lot, something about the colors of the horses standing side by side, it was fun to paint, not sure what is next, I would like to try and paint larger....different size paper... I will let you know, and thanks to Uncle Jeff for letting me see through his camera, can't wait to get more of his pictures! I have linked an article about veterinarians in Kentucky who are scheduling free gelding of male horses to address the isssue of overpopulation of horses, and reduce unwanted horses, sort of another angle on horse rescue! Check it out. I am so happy that you have visited and are enjoying the horse paintings, I will be inspired to bring you more. 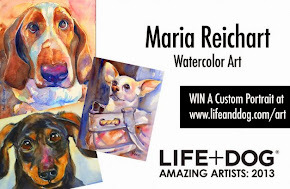 Your paintings are wonderful as well and I especially like the dog paintings, look forward to seeing your latest painting completed. This painting turned out beautifully! Thanks Theresa, you had me motivated with all those wonderful horses which you painted on your blog! Beautiful horses and I love the bunny too. I am working on some paintings for 2 animal related, juried exhibitions which need to be submitted early January, so... probably more horses for a little while! This is beautiful, Maria. The way the one horse is positioned along the other creates really nice movement in the painting. Olivier and Linda, I appreciate your comments so much, thanks for taking a look, Maria. Love these horses! Great job.. Its a very unique horse painting. Thank you for your kind words on my blog. That means so much! Your talent is amazing and I love your paintings. Beautiful! Jennifer and Amy, I am glad you like my painting, I look forward to your next posts, thank you for your visit to my blog.